Source: Denny, Dallas. (2017, 5 May). I want a divorce. Unpublished poem. 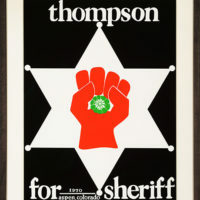 Image: Poster for Thompson’s 1970 political run for sheriff of Aspen, Colorado. This poem is not personal—that is, it’s not based upon my own life, although I’ve gone through something similar. Rather, it’s my reaction to a panel from Gonzo, Will Bingley’s and Anthony Hope-Smith’s graphic novel about the life of the late Hunter S. Thompson. In the panel, Hunter’s no doubt long-suffering wife has finally left him. “I want a divorce,” I said, and hurt blossomed in her eyes.